The DCR 200i from Leuze electronic is the new code reader for the fast decoding of 1D, stacked and 2D codes and has been developed for equipment used in packaging systems, automation, robotics and produc-tion (ARP). Its surprisingly simple handling ensures a significant saving of time during commissioning and when changing devices. Furthermore, the DCR 200i impresses with its extremely high reading performance. To ensure flexible product control and complete product traceability, predominantly image-based identification systems are today used for reading the codes on packaging in the pharmaceutical, food and beverage industry as well as on production lines in the ARP industry. Here, fast reading performance, functional reliability and availability as well as easy operation and maintenance are particularly relevant for system manufacturers and end customers. 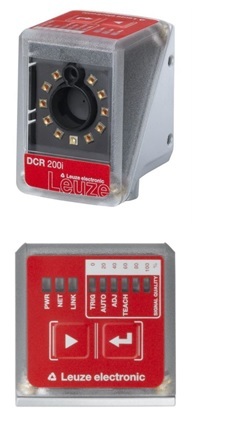 The new DCR 200i from Leuze electronic is a camera-based code reader which is specifically tailored to this task. It reliably detects and identifies bar codes, stacked codes and Data Matrix codes and checks them for readability, completeness and plausibility, thereby ensuring the traceability of foodstuffs, beverages, pharmaceutical and cosmetic products as well as all types of non-food articles. Owing to its compact design, its fastening concept and its easy handling, the DCR 200i can be integrated simply and quickly in a wide range of different applications. This applies to its mechanical installation as well as its commissioning and configuration. The code readers of the DCR 200i series are operated and configured comfortably using the graphical user interface of the integrated Leuze electronic webConfig tool via an Ethernet interface. The integrated web server renders an external program unnecessary. A special feature is the configuration wizard which allows the user to set up the DCR200i in just three minutes. For the majority of all application types, however, the teach function using the two buttons on the control panel of the DCR 200i in combination with a smartphone app developed by Leuze electronic is suffi-cient for configuration. With this so-called "easyhandling" concept, 'the sensor people' from Owen/Teck have made operation of the code reader considerably easier and therefore significantly faster. The DCR 200i code readers also demonstrate a particularly high reading perfor-mance with speeds of up to 6 m/s. The fast imager and the powerful integrated LED illumination as well as the high resolution in combination with an extremely high depth of field ensure reliable decoding even in the case of fast processes and high object speeds. This makes processes especially in highly dynamic packaging tasks more reliable and in many cases also allows applications to be accelerated. To allow adaptation to a multitude of different reading tasks, the DCR 200i code readers offer extensive device configuration options via the control buttons, configuration codes or software. In addition, LEDs on the device provide information on the reading quality of the taught codes. Optimum adaptation to applications, however, starts with the modular structure of the DCR 200i code readers and ensures that even the most difficult of codes can be read. The selectable optics variants High Density (N optics), Medium Density (M optics) and Low Density (F optics) cover reading distances of approx. 40 to 360 millimeters. The housing hood can easily be replaced for specific requirements, e.g. if a plastic protective screen is needed in the food industry instead of the usual glass screen or if specific operational conditions require a polarization filter. So-called diffusor foils for the screen on the housing hood are also available for reducing interfering reflections. The code readers of the DCR 200i series are operated as stand-alone devices with an individual IP address in an Ethernet star topology. In addition to the integrated RS 232, RS 422 and Ethernet process interfaces together with XML communication, a modular connection unit MA 2xxi from the Leuze electronic accessory range is also available to enable connection to other fieldbus systems such as PROFIBUS, PROFINET, EtherCAT etc. Four freely programmable switching inputs/outputs are available for the activation or signaling of states.